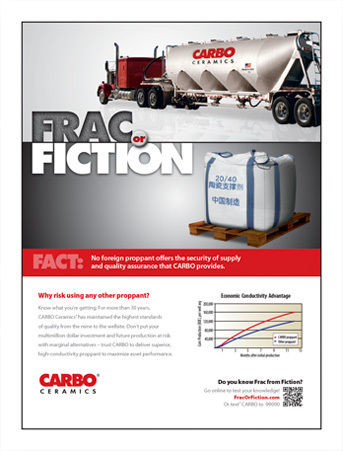 CLIENT: CARBO is a global provider of products and services that increase productivity in oil and gas reservoirs. Their primary product is ceramic proppant, which is used during hydraulic fracturing. CHALLENGE: In recent years of exploding fracturing growth, a number of ceramic proppant competitors emerged in an attempt to capture market share. Most of these competitors (especially foreign ones) offered a limited and inconsistent product with unreliable supply. None of them could match CARBO’s technical expertise, manufacturing capabilities, experience, nor fracture modeling tool set. Nevertheless, the emergence of these alternative sources of ceramic proppant meant CARBO needed to develop a hard-hitting, competitor-oriented marketing strategy to affirm and reinforce its leadership position in the proppant sector. The campaign needed to deliver a comprehensive message emphasizing technical expertise, security of supply and optimized production rates. It also needed to capture qualified leads. SOLUTION: An integrated campaign was developed with multiple touch points and mechanisms to gather interested prospects’ information. 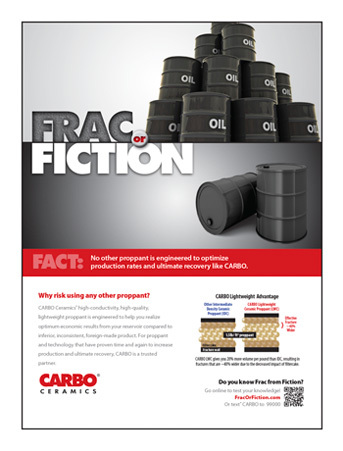 Print and online ads featured information about CARBO and their competition, and then asked the question “Frac or Fiction?” To find the answers, we created an online quiz to educate customers about CARBO Ceramics. 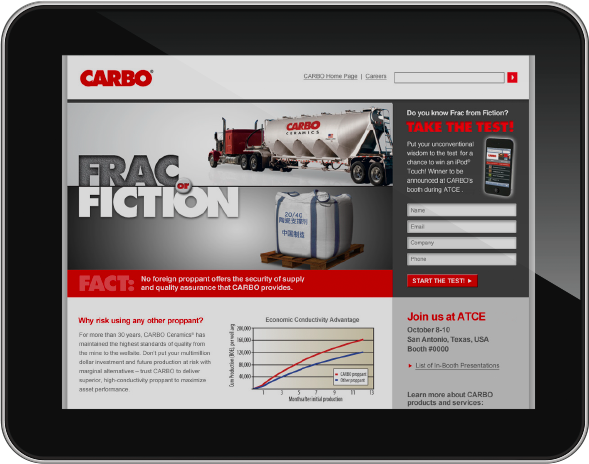 The custom landing site and interactive quiz were designed for both desktop and mobile viewing to maximize response. 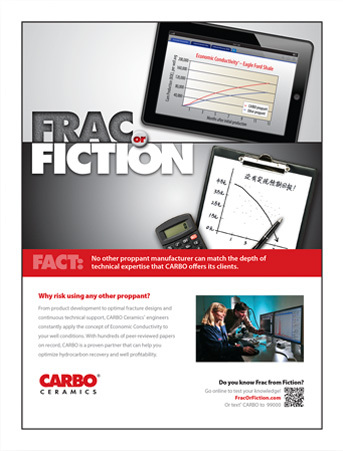 The campaign coincided with CARBO’s presence at the Annual Technical Conference and Exhibition (ATCE). An email invitation to ATCE was sent with a link to the quiz and an ad was placed in the ATCE conference program. 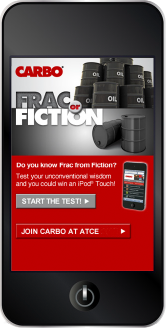 The creative was incorporated into the tradeshow booth where the Frac or Fiction quiz was on an interactive kiosk.